Pianist Marilyn Garst and tenor Erik Gustafson prepare for their concert in the next Unitarian Universalist Recital Series. “Not while I’m Around” is one of Stephen Sondheim’s warmest ballads. It arrives in the middle of one of his darkest, coldest musicals, “Sweeney Todd.” The message is that no matter how dangerous the world is, nothing will harm you, not while I’m around. Tenor Erik Gustafson has chosen to sing four Sondheim songs to close his unusual program in the next Unitarian recital series at 7 tonight. In addition to the glowing candle from “Sweeney Todd,” Gustafson will provide something different, and from my perspective, welcome in the middle of a predictable, high-sugar content musical season. 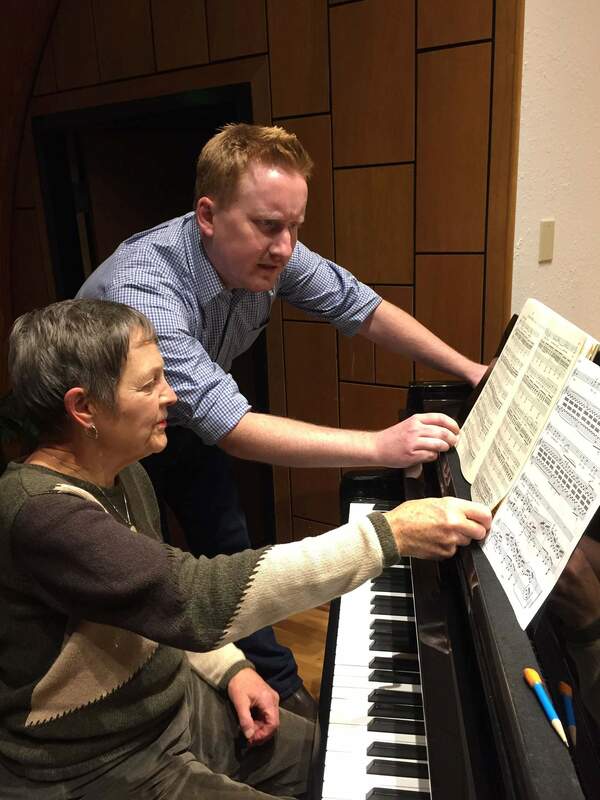 At a rehearsal earlier this week, Gustafson and pianist Marilyn Garst extensively rehearsed the centerpiece of the recital: Robert Schumann’s “Dichterliebe” (Poet’s Love). At one point, Gustafson referenced Sondheim’s “Finishing the Hat,” and made a momentary, unexpected connection. To me, the reference centered on musical complexity. Schumann’s “Poet’s Love” is a major Romantic period cycle of 16 songs written in 1840, the year the composer married Clara after a long and difficult courtship. The text by German poet Heinrich Heine tells the story of love’s complications – from early bloom through disillusionment, some bitterness and ironic despair. Sounds perfect to pair with music by Sondheim, the American master of modern romantic irony. To open the recital, Gustafson and Garst will present three selections from “Les Nuits d’été” (Summer Nights), by French composer Hector Berlioz. The complete cycle contains six songs and was originally composed in the early 1840s for piano and voice. The time frame is similar to Schumann’s work but drew on texts by French poet Théophile Gautier. You’ll hear three stages of love, opening with youthful innocence, traveling through loss and mourning, and concluding with “L’ile inconnue,” a song of renewal. Gustafson is a member of the Santa Fe Desert Choral who sings and records with a number of other professional ensembles, such as The Bach Collegium of San Diego. Last year, he and his wife, mezzo-soprano Kerry Ginger, participated in two Grammy-winning albums recorded by the Phoenix Chorale. The couple attended the ceremonies, taking a brief hiatus from their vocal teaching jobs at Fort Lewis College. Gustafson and Ginger are founding members of Quadrivium, a new professional ensemble that serves the Four Corners. Last season, Quadrivium helped Garst celebrate the 10th anniversary of the UU Recital Series. This is a rare chance to hear an extraordinary singer perform an intelligent selection of works in an intimate setting. Tickets: Adults $20, students and children $8. Available at the door. More information: Call 385-8668 or email mmgarst@durango.net.